Tue., Nov. 28, 2017, 9:57 p.m.
PULLMAN – Just how effective have Washington State’s 3-point snipers been this season? 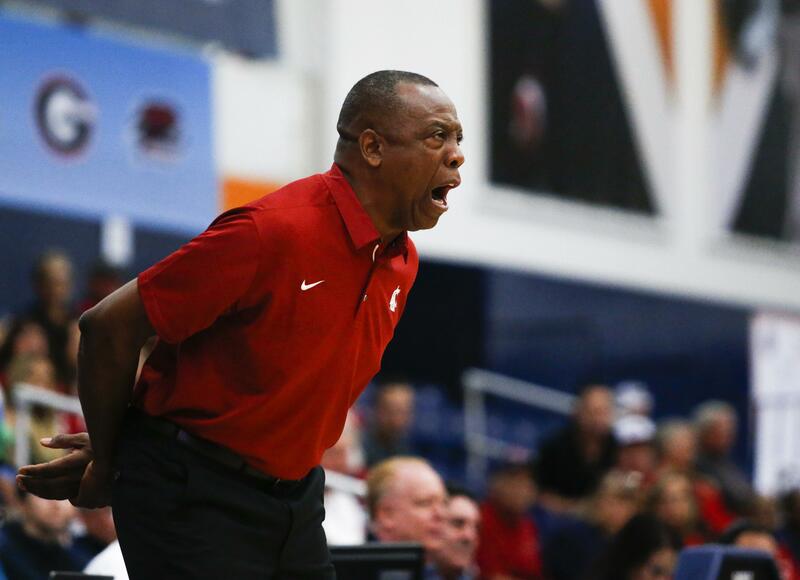 The Cougars are averaging 13 3’s per game – best among Pac-12 teams and good enough for second in college basketball. The only team making more is the same one that produced the Golden State Warriors’ Stephen Curry. That’s Davidson, at 13.5 makes per game, though that number’s slightly skewed given the Wildcats have played four games to the Cougars’ six. But the shooting exhibitions aren’t just closed-door events now. The Cougars are making more 3-pointers per game than 345 other Division I college basketball programs across the United States, and they’re doing it at a 41.7 percent clip. That’s better than Curry’s alma mater (39.4 percent) and better than Colgate (40.4), which has matched WSU’s per-game average with 13. The men’s basketball program at WSU captured its first trophy in eight years over the weekend by winning the Wooden Legacy tournament in Fullerton, California. The Cougars had to beat three of the country’s better-known mid-major programs – Saint Joe’s followed by No. 21 Saint Mary’s and then San Diego State in the finale – in a four-day span while playing outside the city limits of Pullman for the first time this season. But they never looked uncomfortable and never seemed disjointed shooting the three-ball. Only once in the tournament did the Cougars shoot it at under 45 percent. That was against Saint Mary’s, when WSU launched 21 attempts and only connected on seven. But in the Wooden Legacy opener, the Cougars torched Saint Joe’s, making 16-of-33 (48 percent) from beyond the perimeter and closed tournament play by canning 13-of-28. “We’ve got four guys that are shooting 40 percent or more from the three-point line,” Kent noted. That quartet begins with two players shooting better than 50 percent: Carter Skaggs, a 57 percent 3-point shooter who at one point made 10 in a row, and Viont’e Daniels, who’s made as many as Skaggs (15), but has just one more miss. Forward Robert Franks is at 48 percent (16-of-33) and Kwinton Hinson is at 42 (3-of-7). And none of those four were as accurate in Fullerton as WSU sophomore Malachi Flynn, the Wooden Legacy’s most outstanding player who squeezed in 59 points during his stay. Flynn was 12-of-24 from long range and shot himself out of an early-season slump that saw him make just four of his first 21 attempts. Kent believes Flynn got on track because he shot with more urgency. The Cougars practice at a furious tempo and utilize a 12-second shot clock that forces them to think quick and shoot even quicker. NOTES – Franks tweaked his ankle in the second half of the Wooden Legacy title game, but returned to the floor to finish out the contest. Kent doesn’t believe his leading scorer will have to miss any time, given that the Cougars don’t play again until Saturday. “We have two days off and he can take a third day if need be,” Kent said. … Five more unbeaten teams lost on Tuesday, making WSU (6-0) one of just 23 teams in college basketball with an unblemished record. … Kent says the Wooden Legacy trophy will reside in the coaches’ office for a few days before taking up permanent residence in WSU’s locker room: “It will be the defining moment for this team, the reference point for how far they’ve come,” Kent said. Published: Nov. 28, 2017, 9:57 p.m.